Within the pages of this website you will find information and services related to our Association, and also information related to the Royal Air Force and the modern day 100 Squadron. This website, is here to tell the world, all about an amazing Squadron and it’s history. It is also here to keep our members informed of latest news and upcoming events. 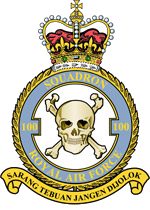 If you or a relative served with 100 Squadron, you may be entitled to become a member of a very active Association. Helping the rest of our members to keep the memory of our past comrades alive. If you are searching for information about a relative who was part of 100 Squadron in any Capacity, then please do not hesitate to contact us, and we will do all that we can to help you. Please feel free to look around, and to learn as much as possible about an amazing Squadron, with an almighty history. If you or any of your family are or have previously served with 'The Ton' then please do join our very special association. We pride ourselves on creating special friendships and keeping close links with the modern day 100 Squadron. If you would like to find out more about becoming a member, then please do get in touch with us via our Contact Page. Copyright © 2019 100 Squadron Association RAF. All rights reserved.